Mauritius as a holiday destination is an Indian Ocean island which suits everyone - from honeymooners to family holidays, from relative budget to five-star luxury. Perhaps what sets this island apart from others is the innate cultural cross-overs, the existence of a number of dominant religions and languages, the cross pollination of everything which allows every type of holidaymaker to exist on the same island and be well catered for. In terms of luxury holidays, Mauritius has a lot of choice which is a good thing - each resort keeps the next on their toes and on top of their game. There are places which leave one building in a certain style to accommodate a particular age group who prefer the natural look or colours of the room. The hotel business is built on trend and fashions but it also encourages loyalty and holding onto the visitors who like a certain look must also be a consideration. Family holidays in Mauritius are a definite winner - with a whole variety of choice to suit budget and tastes. Admittedly it is never going to be uber cheap, you are still in Mauritius and it still costs money to get there (such a shame...), however Tropical Sky do have three-star properties which may suit your holiday budget. The family holiday in Mauritius is all about what's included and will it suit every age group that you are going on holiday with. Take the advice of your Tropical Sky consultant, whose job it is to understand the differences between the resorts, then you can work out what suits you. Invariably the consultant will have been to Mauritius and have an opinion which may help you make up your mind. Essentially decide between all inclusive and half board - bearing in mind lunch and drinks in the resorts are about the same price as London. Otherwise if you hire a car or travel on the islands transport you can eat locally at the markets and road side cafes - experiencing creole cooking or a simple hamburger! 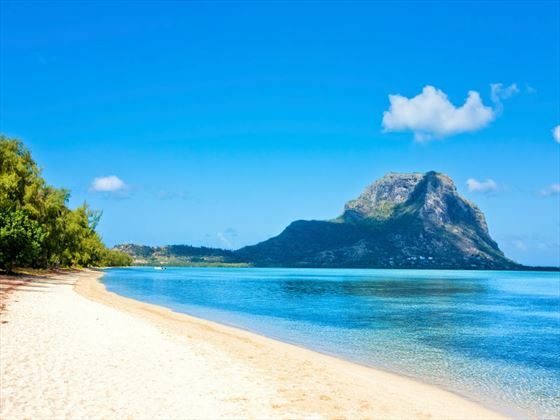 The beaches around Mauritius are divine and if you enjoy swimming in the sea you will be spoilt for choice. Take a boat trip out snorkelling or sail enjoying the warm waters. It is also a great place to learn new watersport skills because it isnt such a big deal falling in. Equally the green interior is mountainous and there are a number of village tracks to wander - you can even go zip wiring, albeit on a smallish scale (six rides). Honeymooners can easily find their own space in the resorts and hotels of Mauritius. There is generally plenty of gardens and botanical plants around to create ’fake’ space but truly the beaches and the sea are empty, even when they’re full. Honeymoons are about treats and Mauritius is perfect on that front, with a country which well understands its tourist market and caters for you accordingly. Whilst there are lots of ways to add in sooper-dooper ness by means of a credit card, the natural beauty of the island comes for free, and it is very relaxing just chilling by the pool or beach. Mauritius is perceived as a glamorous destination, with good reason. Most of Europe, particularly the Italians and French appreciate chic and elegant resorts and Mauritius certainly has its fair share of those. The resulting mix of nationalities makes for an easy and relaxed atmosphere - although it is said in Mauritius that Brits favour the north east of the island as it is cooler with a gentle breeze. To the west of the island, the mountains reduces the breeze reaching the coast, so it is said that it is for the nationalities used to hot climates - there is sense in that, but it's not clear whether anybody living outside of Mauritius knows it! This stunning resort hotel in Mauritius is located on pristine white sands overlooking the Bay of Balaclava. Noteworthy amenities include an outdoor sea front infinity pool, tennis courts, a full-service spa and a selection of five restaurants from Asian Fusion to Mediterranean cuisine. This hotel in Mauritius is the ideal base to discover the natural wonders of snorkelling or diving the Baie aux Tortues, shopping for handmade crafts in Port Louis or exploring the Grand Baie district. Set amidst manicured gardens and luxuriant surroundings, the resort’s 100 rooms feature a minimalist design, blending colours with fabrics that mirror the sun-filled landscapes and azure waters. The brand new Centara Poste Lafayette Resort & Spa Mauritius is loacted on the unspoilt north east coast beside a pristine beach and turquoise lagoon. The resort is located just 20 minutes from Grand Bay with shopping, bars and restaurants galore. The Creole architecture and contemporary design belnds well into it the hotel surroundings. of The warm and vibrant colours of all 60 rooms create a cosy welcoming atmosphere, enlivening the traditional lifestyle of Mauritius, so naturally reflected by its very caring and smiling personnel. Time there just seems to have come to a standstill, softly emphasized by outings in the lagoon and siestas in the shadow, as the perfect place to rest for couples or families. The airline operate four non-stop flights weekly from London to Heathrow by modern Airbus A340 aircraft. Air Mauritius not only welcomes you to Mauritius but they also open up the world beyond twinning an Indian Ocean stay with other destinations like South Africa, Australia, Hong Kong, and India. Regional connections are available from numerous regional airports which ensures that you’re only a short flight away from your non-stop Air Mauritius flight to paradise. The airline’s flagship product is available on two next-generation A340-300E* aircraft, which offers you the choice of either Business Class or a greatly enhanced Economy class cabin. All seats feature individual 9” touch screen seat-back video screens with a choice of 50 video and 60 audio channels of entertainment on demand (AVOD), a selection of two hot main courses and friendly Mauritian service to put you in the holiday mood. Choosing Business Class will allow you to spend your time in-flight seated in one of the new generation lie-flat seats on our Airbus A340 aircraft. With a 152 cm (60-inch) pitch, these seats offer you the privacy and convenience of a personal cocoon. They can be adjusted by remote control and offer a massage option as well as inflatable lumbar pouches for additional comfort. You'll enjoy a personalized cabin service, and your meals will give you a fine taste of Mauritian cuisine, rich in flavour and variety. For your relaxation: a selection of high digital quality, multilingual feature movies and the latest international album. *Available on non-stop flights to/from London Heathrow only. Air Mauritius is proud to have been voted the leading airline in the Indian Ocean at the World Travel Awards for the last seven years.